Diana, Princess of Wales. Part 2: What happened to her BaZi the day Princess Diana died? Let’s look at the time when the accident happened. 戊戌 1993 TaYun was supposed to be Princess Diana good and favorable TaYun. Could Princess Diana have avoided the crash? If you are very good, seeing something like this even at a glance, you should be able to recognize the problems. To all my students, now it is time to test your skills. Diana, Princess of Wales. Part 1: Should Diana have married? Diana, Princess of Wales (born Diana Frances Spencer), was a member of the British royal family. She was the first wife of Charles, Prince of Wales, the heir apparent to the British throne, and the mother of Prince William, Duke of Cambridge, and Prince Harry, Duke of Sussex. Part 2: What happened to her BaZi the day Princess Diana died? She has married four times in her life. It’s not hard to fall in love, but it’s hard to keep it. It’s not difficult for her to fall in love, but it is hard for her to maintain it. She has a personal life which is full of ups and downs. Though she has been successful in her career and has well maintained her professional life, she failed to do the same in her personal life. Inauspicious spouse stars equal bad husband, bad wife? I always being asked the same question over and over again. Inauspicious spouse stars = bad husband, bad wife? Another Peach blossom girl or a successful lady a good mother and a good wife? Since my last article “Peach blossom girl” many have asked if a lady with multiple spouse stars (husband stars), does this means she will always have multiple relationships or even marriages, will she be faithful or cheats around. By just looking at the number of spouse stars DOES NOT CONCLUDE that she will not be a good wife and she will not have a good marriage. Today I will show you a lady with 6 spouse stars (官杀) excluding those formed after assembling. Now let us take a look. BaZi : The story of Ah May : Her current Ta Yun. 2009 was a very rich year for her. She had put almost all her saving from the day she worked in the factory with her sister for investments and safe guard purposes. From these investments, she made a lot of money. BaZi : The story of Ah May : Her second Ta Yun : Marriage. When her spouse star appeared in 1996, she was introduced to her husband when she was working at a factory. His husband is much older than her by almost 30 years and already have two children. My next article will discuss about her current Ta Yun and what will happen to her. BaZi : The story of Ah May : Her BaZi violates Fan Yin Fu Yin. "Fu Yin" happens when one pillar's stem/branch are exactly the same as another pillar for example hour pillar with Ding sitting on You and month pillar with Ding also sitting on You. Fu Yin can be bad or good depends on what are the Ten Gods, favorable or hostile their element and so on. "Fan Yin" happens when one pillar clashes with another pillar. Pillar clash indicates instability and usually not good. Now take a look at Ah May's BaZi Four Pillar of Destiny. My next article will discuss about her marriage. BaZi : Ta Yun that jinxes husband. In 1999, Jenny (not her real name) lived-in boyfriend died in a car accident. After two years have passed, she came and asked if she still have any chances of marriage and have children. Now take a look at her Ta Yun. BaZi : Love is hard to find and is harder to keep. Some said love is so hard to find, because love itself is so difficult. Or love is hard to find because it is not meant to be found by you. Some misses their only chances to find their husband and others may be too confused to really appreciate love when it walks through the door. Can our BaZi provide us with some clues? If a given year is particular bad for our marriage or relationship, can we save our marriage with extra efforts and determination? With the right attitude and determination, nothing is impossible. Here is an example of a real person. BaZi : Their spouse or marriage palace are having clashes. Will their marriage end up in divorce? Separation? There have been many question being asked and all about spouse palace or marriage palaces having clashes. They want to know if their spouse palaces are having clashes will their marriage end up in divorce. Spouse palace having clashes - Will their marriage end up in divorce. Answer : NOT NECESSARY. Chart 1. The husband's BaZi Four Pillar of Destiny. Love and marriage luck - Poor BaZi and poor Ta Yun. Part 3 of 3: Her thrid Ta Yun. Does all romantic experience ended up in marriage? Many are happily married and have children. But the numbers of those that do not make it into marriage are also high. Chart 1. Her third Ta Yun from her BaZi Four Pillar of Destiny. Love and marriage luck - Poor BaZi and poor Ta Yun. Part 2 of 3 : Her second Ta Yun. When our spouse stars appear especially sitting at stem, for ladies will most probably meet their suitor or for man will most probably pursues a relationship with a particular woman with a view to marriage. However, seeing your spouse stars does not guarantee marriage. It still has to depend on others condition. These condition include the welfare of your stars, the condition of your spouse palace, others stars in your BaZi Four Pillar of Destiny, others stars in your Ta Yun, any ten gods combinations, able to do transformation or unable to transform, the strength of your spouse star, the strength of the enemies of your spouse stars, the involve 5 elements, the element of your spouse star and many more. There is also condition such as your age, your career and your finance. Beside BaZi your life pre-destined path you also need to consider human personalities or human luck. This human luck more or less you can control or change; we as human have our thinking and are able to make choices. Chart 1. Her second Ta Yun from her BaZi Four Pillar of Destiny. Love and marriage luck - Poor BaZi and poor Ta Yun. Part 1 of 3 : Her BaZi. Some are blessed with smooth and happy marriage. But this does not necessary happen to all and very often many people are concern about marriage. This includes all parents having a daughter that is still single and is now over thirties. Many ladies over thirties that came to me are concern about marriage. Every time, it is hard to tell them the bad news. However there is always hope. The suggestion to them will normally be their projection of certain personalities that will definitely help in their love life and make their road ahead much smoother. Chart 1. Her BaZi Four Pillar of Destiny. ..
BaZi : What it takes to marry a rich man. Part 6 of 6. The year when she has her first baby. After marriage what next? Children of course. Cathy Tsui Chi-kei (徐子淇) gave birth to a healthy baby girl in 2007 one year after their marriage. Now look at her BaZi Four Pillars of Destiny chart. Chart 2. Her first baby year. BaZi : What it takes to marry a rich man. Part 5 of 6. The year she was married. After she has fame and wealth, what next? Marriage? Yes you are right. She is Hong Kong artist Cathy Tsui Chi Kei (徐子淇). She married Martin Lee Ka-shing (李家誠), the 2nd son of wealthy businessman Dr. Lee Shau Kee (李兆基). Lee Shau Kee is the founder of Henderson Land Development Company Limited, with an estimated personal wealth of US$9.3 billion (according to Forbes 2005, that’s US$9,300,000,000). He is the 3rd wealthiest man in Hong Kong, and his son is going to succeed some of his wealth for sure. Chart 2. Her marriage year. BaZi : What it takes to marry a rich man. Part 4 of 6. Her wealth in her Ta Yun. Even in a particular auspicious and wealthy Ta Yun, there is normally one or two years that you are exceptionally wealthy. If you are lucky you might have more wealthy years. You might wonder whether all auspicious Ta Yun will sure have wealth or money luck. The answer is “not necessary and it depends”. Some have both money and fame and some only have fame but not very wealthy. Only a few have all three; fame, money and authority. What they are having will depend on their BaZi quality and potential and their Ta Yun. Chart 2. Her wealthy year. BaZi : What it takes to marry a rich man. Part 3 of 6. Her fame. Being famous has real advantages in marriage especially you want to marry a rich man. The more beautiful, gorgeous and elegant you are the more rich suitors around you. Her Bazi Four Pillars has the potential to be famous and rich; together with auspicious or good Ta Yun she will prosperous. Chart 2. The Ta Yun that she has her fame. BaZi : What it takes to marry a rich man. Part 2 of 6. Her education. Education is very important to all of us. Without education, we will be lacking of confident and it will affect the way we talk and the way we interact with others. Education will open up our horizon to more opportunities and to more people. In short we will have more choices. Chart 2. Her early Ta Yun the 10 years luck cycles. BaZi : What it takes to marry a rich man. Part 1 of 6. Her BaZi and her potential. Have you always dreamed you'd marry a rich man who would pamper and protect you? Finding a rich husband is not so easy for everyone. It's hard to marry a rich man and living with that rich man can pose a challenge. Never mind about the second part after the marriage if it ended up like a fairy tale or not. Today, I will basically talk about a person BaZi Four Pillars of Destiny that have the quality in marrying a rich man. Chart 2. Her BaZi Four Pillars of Destiny. The four big Ta Hua Peach Blossom. Her BaZi has all four but. By looking at their BaZi Four Pillars of Destiny, there were very clear evidence that by just looking at their stars ie. 子午卯酉 zi wu mao and you is not very accurate and conclusive. 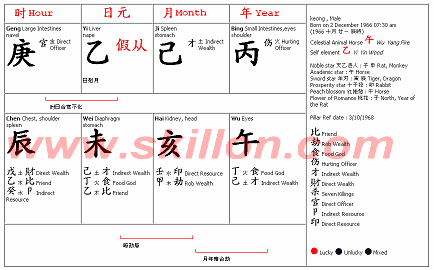 The more important aspects like his spouse star condition, his spouse palace, what star is sitting at his spouse palace, his spouse star is healthy or badly hurt, his spouse star being combined and taken away in his BaZi chart or in his Ta Yun and so on. One more very important aspect is his Ta Yun. There is many more aspect to look at. Chart 1. Her BaZi : She has the complete set of all the four big Ta Hua. Does love at first sight exist? What our BaZi can tell? Do you believe in love at first sight? In Asia approximately 60% do. And over 50% say they have experienced it. You were walking down the street, everything was normal and then suddenly she was there and it happened that you fell in love with her at the first sight! What is the answer? The answer is quite straight forward; it is all related to how your mind works. If you are single or currently not in a relationship then your mind will always be on a hunt for your long awaited partner. Even if you think that you don't care about relationships now still you will fall in love with the first person who matches your criteria. Chart 1. Her love at first sight. Jinxes husband - Part 2 - the husband. This is the second part of the article “Jinxes husband 剋夫命” You can read the first part by click the link here. Very often if not all, the man will show even stronger symptoms of disaster on a particular year. Somehow very coincidentally it reflected in his wife’s BaZi Four Pillars of Destiny; some even reflected in their children BaZi Four Pillars. You can say this as coincidence, it up to you to decide. It is just very unfortunate that all the blame go to the ladies especially in older Chinese community. When the opposite happened, very seldom the man is to blame and getting another wife is also not very difficult. Chart 1. He died in 1997 in an accident.